Information and questions from the Heath Anthology site. The William Cullen Bryant Homestead site includes a picture of Bryant's house. Bibliography and study questions from Paul Reuben's PAL site. Kindred Spirits, a picture of William Cullen Bryant and Thomas Cole by Asher B. Durand (1849). Original at the New York Public Library. 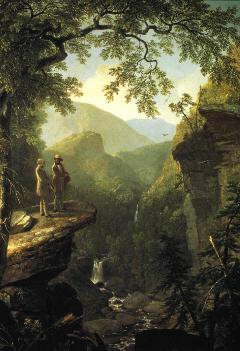 Image courtesy of Sandra Hildreth's NEH-supported Hudson River Paintings site (site no longer available). Poems. Searchable database of the entire 1840 edition at the University of Michigan. See all selections from the Michigan MOA project on Bryant.